How is the experience of an artist different today than during the Italian Renaissance? There are several answers. Certainly, the perception of what it means to be an artist has changed. How one becomes an artist has also changed. The breadth of an artist’s work is different as well. Ask anyone today what an artist does and you’re likely to get a response that includes something about “expressing themselves or their feelings”. To be sure, many artists today do use their art to express their own personal feelings and opinions. Self-expression has become a valued personal characteristic in western society over the centuries. Many artists use their art to explore political and social issues that they feel strongly about. Other artists use their skills to reveal the beauty in life as they see it. Whether showcasing a political issue or a search for beauty in life, the artist of today is part of their artwork. They choose their subject. The artist of today must bring something of his/her self to the table. In a sense, art has become more personal. The artist’s voice is louder today and the public is interested in hearing it. By contrast, Renaissance art was less of a reflection of the artist’s own concerns and desires. During the Renaissance, artists were more likely to paint on a commission basis. 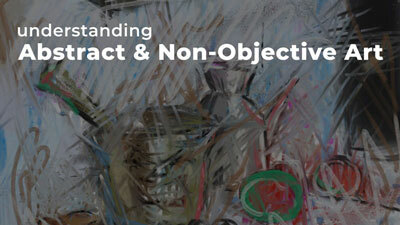 A person or organization would simply hire an art studio to paint or sculpt a predetermined subject. 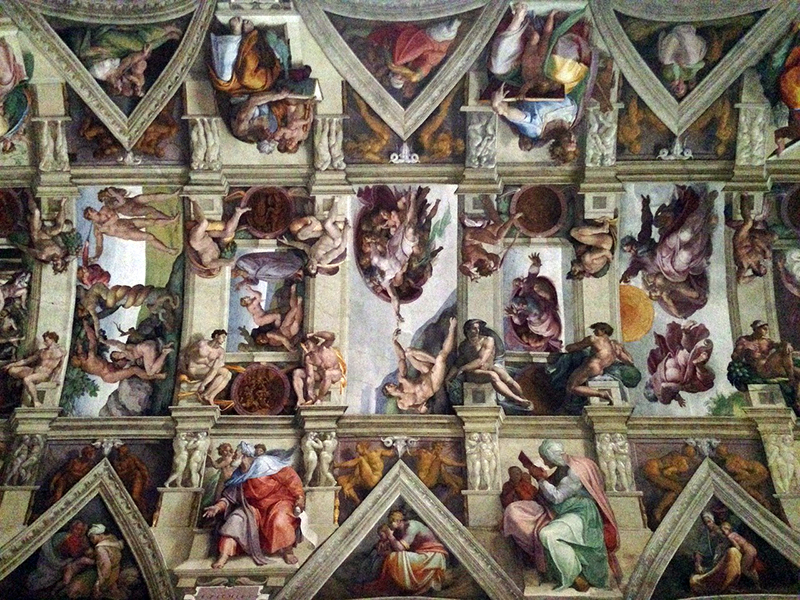 For example, when Michelangelo was hired to paint the Sistine Chapel, he did not choose to illustrate the Bible. Instead, he was hired to illustrate the Bible. Of course, the manner in which he illustrated the Bible was his own. It was his design. 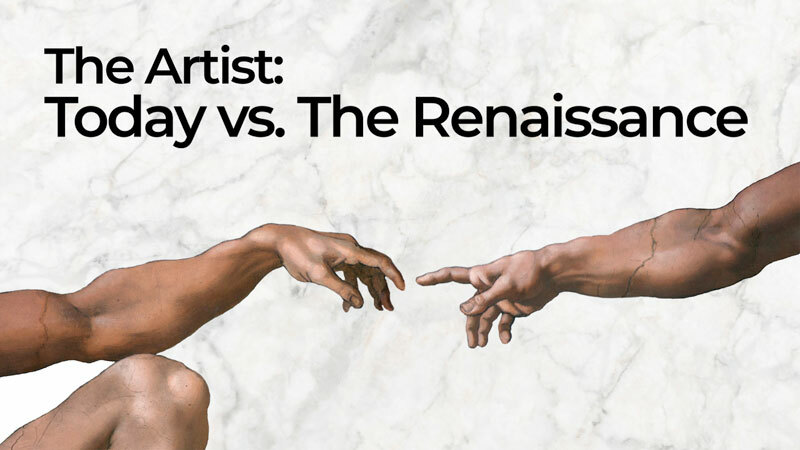 Today, the Renaissance artist better fits our contemporary concept of an illustrator. As an example, think about a children’s book. A children’s book illustrator creates pictures that correspond with a writer’s words. That is exactly what Michelangelo was doing with the Sistine Chapel – painting imagery that someone else had written first. For this reason, artists were, during the Renaissance and before, perceived more as craft persons than as intellectuals. Of course, it was the high level of artwork produced during the Renaissance that began to challenge that very perception. Michelangelo himself contributed to the evolution of how artists are the perceived. His often-quoted utterance, “A man paints with his brains and not with his hands”, was a proclaimed that art-making was, in fact, intellectual in nature. Today’s society has embraced that notion. Artists still take commissions today; usually portraits and murals. Many, however, create artwork first, according to their own inclinations, and then take it to the marketplace to sell. Some sell original artwork through galleries and websites. Others license the use of their artwork for uses on other products. How does one become an artist? Successful artists today may be highly educated or entirely self-taught. Art has become unique in that way. Many art collectors today see added value in self-taught artists. In fact, there is more opportunity for self-directed learning that ever before thanks to online resources. The Virtual Instructor is a fine example. Most artists learn their craft in secondary and post-secondary schools. These days, some art students become serious at the high school level, increasing their intensity in college (university). For most, the bulk of serious art instruction is received at the ages of 17-23. What kind of educational experience should one expect today? College level art students learn about drawing, painting, sculpture, printmaking and design – often concurrently. They may also work with video and sound in some of today’s art programs. Art has become so varied (realistic, abstract, conceptual) that the school one attends determines the focus of one’s learning. Some art schools today may not even agree on what good art is. Once a student completes his/her course work (with passing grades), a diploma or degree is issued and the student is now an artist. The newly-minted artist might then pursue gallery shows, participate in art festivals or use a website and social media to increase their level of public exposure. If the artist’s work is well received (which means it sells), the artist increases his/her chances of securing an agent. An agent will look for broader market opportunities by licensing the artist’s work for reproduction. Success! 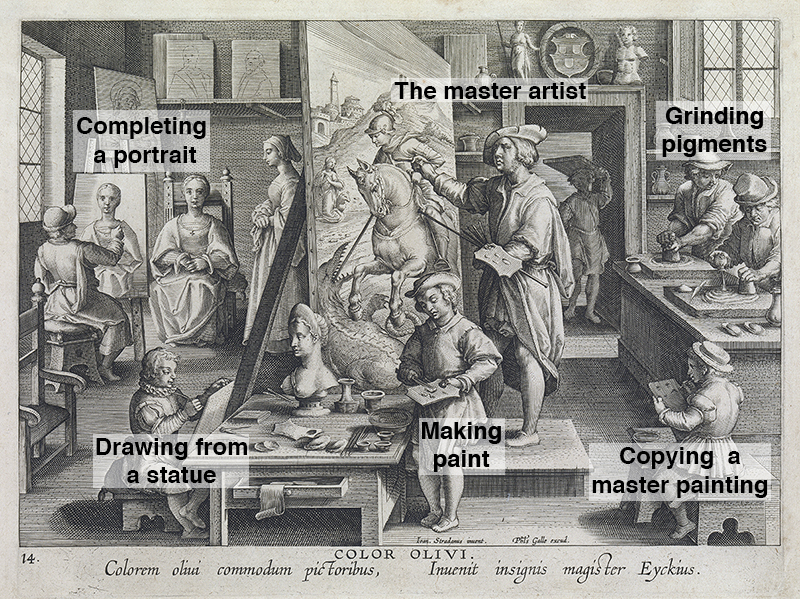 The education of a budding Renaissance artist looked different in some ways. Artists, like metal smiths and stone workers, were part of the apprentice system during the Renaissance. If a child showed aptitude for drawing his family would, around the age of 10, look for an artist to take him as an apprentice. The apprentice would most likely move in with the artist’s family, becoming part of the household. During the first year or so, the new apprentice would grind pigments for making paint. He would also make brushes, apply grounds, cut stone, and otherwise prepare the materials used to make art. There were no art stores as we know them today. Artist literally learned their craft from the ground up. 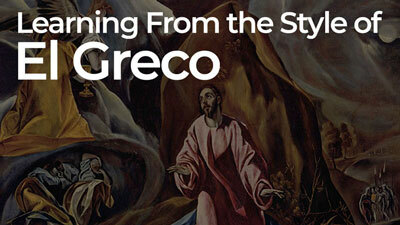 Once an apprentice mastered the preparation of materials, it was time to begin developing his observational skills. During the Renaissance, drawings were not exhibited. 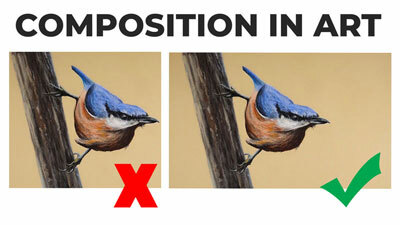 Instead, drawings were made to solve drawing problems (proportional issues, foreshortening, etc.) before a painting was made. The best of these drawings was kept for reference. Apprentices would learn to draw by copying these “master drawings” (or other high-quality drawings completed by advanced apprentices). Copying a drawing is easier than drawing from life because the subject has already been translated from three dimensions to two. 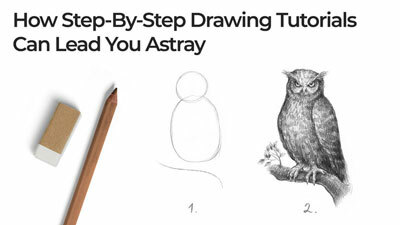 The young apprentice was, during this time, absorbing how more advanced artists had solved common drawing problems. Once the master artist felt good about the skill level of his young apprentice, he would allow him to draw from ancient statues. Drawing from a statue was more challenging than copying a drawing because the artist had to flatten the statue in his own mind in order to translate it to a two-dimensional surface. Of course, ancient statues are also great works of art in their own right, so the assumption was that the young apprentice would still absorb the knowledge of a greater artists through this exercise. Knowledge about anatomy, proportion and pose was learned by making drawings of statues. Only after an apprentice had shown an advancement in skill level from drawing statues was he allowed to draw from live models. Unlike statues, models cannot pose indefinitely. So, at this point, the apprentice is training for speed. Drawing well was only one part of the recipe for success as an artist. One had to also draw efficiently or quickly. Today, artists are specialists by in large. Artists are either painters or sculptors or printmakers or architects. Almost no one does all of those things. During the Renaissance, a wide variety of creative endeavors were the purview of an artist. So much so that the term, “Renaissance Man”, came to describe a person who is successful in a wide range of skilled disciplines. 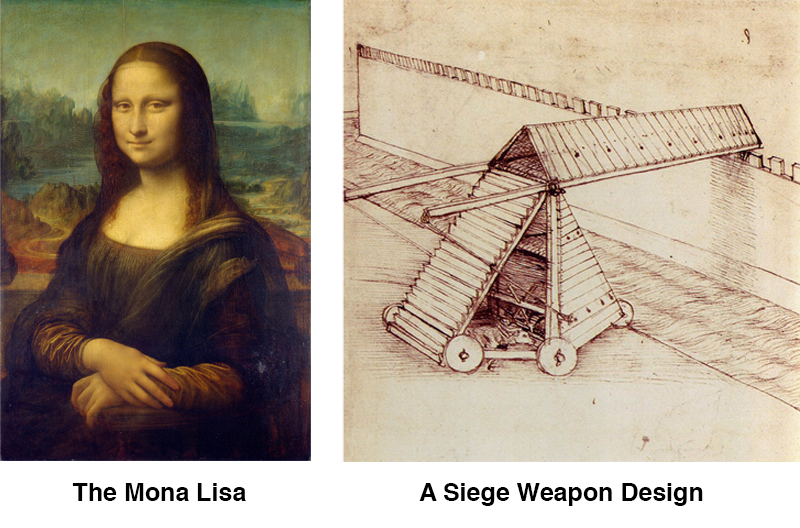 Leonardo Da Vinci is often cited as the quintessential renaissance man. He made paintings and sculptures. He designed buildings and machines. He even explored natural sciences at a high level. Brunelleschi, a great Florentine sculptor, was originally a gold smith. He is credited with discovering a drawing system called linear perspective. It revolutionized an artist’s ability to manage depth in a 2D composition. Later, he designed a dome for the Florentine Cathedral. It was an architectural wonder – the first dome built since antiquity and the largest in the world at that time. Brunelleschi was an artist according to the Renaissance definition. Today, Brunelleschi would have been an engineer, an artist, a designer, a metal worker, a sculptor and an architect. Quite a lot to master. 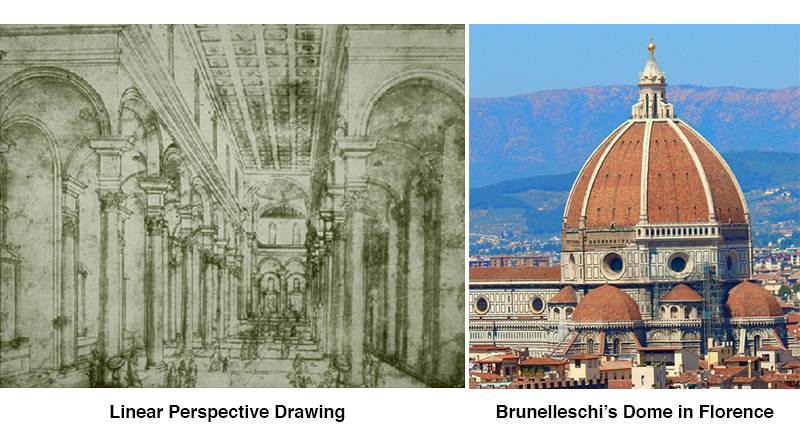 Of course, most artists were not as successful as Brunelleschi. Some artists never left their master’s studio at all, but stayed beyond their apprenticeship as a “hired artist”. Even still, the scope of work for which such an artist was expected to master was more varied than today. Although the experience of an artist has evolved from the Renaissance to today, for most, the purpose of art remains the same – to bring imagery and ideas into the world with as high a level of skill as is personally achievable.